How to disable wifi, prevent connections to unsecured networks and preconfigure a network? 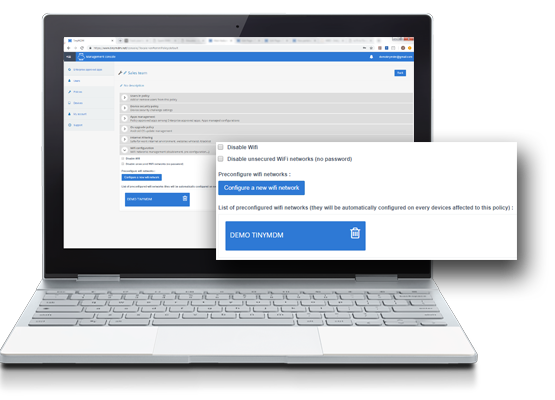 With TinyMDM, choose to disable Wi-Fi from some devices, forbid connections to unsecure networks, preconfigure favorite networks… Everything is designed to help you protect your sensitive data and save some time when using the device. – By ticking Disable unsecured WiFi networks, end users won’t be able to connect to unsecured networks like public hotspots.